IN THE FRACTAL Geometry of Nature (1983), Benoit Mandelbrot writes, “Clouds are not spheres, mountains are not cones, coastlines are not circles, and bark is not smooth.” In an effort to more properly analyze and represent nature mathematically, Mandelbrot developed a new geometric pattern called a fractal. There are various definitions for the complex structure of a fractal, but in general, it is a repeated geometric pattern at progressively smaller scales, which “produce irregular shapes and surfaces.” Mandelbrot outlined four properties of fractals: their dimensions, which are greater than the space they occupy; their “infinitely complex structures”; their quality of “self-similarity”; and finally, he describes a fractal pattern generated by macro iteration. Mandelbrot’s impetus for creating a new geometrical application for nature’s irregular surfaces stemmed from a theoretical question about measuring coastlines. A coastline, when examined in its entirety from a position above the Earth, may appear nearly straight. Imagine picking a center position on such a coastline and moving closer, like a camera, frame by frame. Within each frame, the perimeter of the coastline changes, revealing more nooks, twists, rough angles, and many other irregularities. Now imagine examining the smallest point of coastline visible with the naked eye—perhaps a centimeter or slightly smaller portion of the coast. Even here, the sand, rock, or other soil formation will produce angles and indentations, which would require measurement to record accurately the length of the coastline. Place that small sample of coastline under a microscope, and it becomes even clearer that although the area of the coastline never changes, the perimeter infinitely changes with each iteration, or repetitious movement, closer to a particular point on the coastline. This example illustrates the main properties of fractals and why using fractals is a key measuring and modeling tool for geographers. A circle that never changes size or shape can surround a fractal, but when magnifying the fractal, the complexity of perimeters only becomes greater—it is infinitely complex. A fractal retains its complexity no matter how many times it is magnified, and in fact, with each magnification, it technically becomes more accurate. Returning to the coastline example, each magnification reveals the inaccuracy of the first hypothesis that the coastline was relatively straight. What is important is that because of the infinite nature of fractals and the irregular structure of nature, an element of chaos or randomization can be included into fractal formulas, allowing for an accurate yet approximate measurement. One quality that many fractals have, which a coastline does not, is “perfect self-similarity.” Computerand mathematical-generated fractals will often reveal the exact same image at every level of magnification. The perfect self-similar fractal is composed of smaller versions of itself, although there are fractals, including the Mandelbrot Set, that do not create the same image at every iteration, but smaller versions are revealed with close examination. As a natural fractal, there will not be an exact replication of the coastline at every level of magnification; however, the proportions will generally remain the same. Similarly, mountains appear jagged from a distance and remain that way as a person comes closer to them. Clouds viewed from the earth appear to have the same texture as they do from a plane. These natural examples of fractals have qualities of self-similarity, even though they do not represent perfect self-similarity. 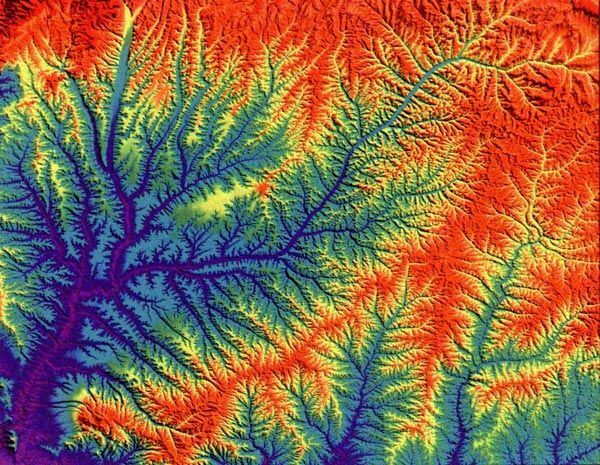 Today, geographers often use fractals to model nature’s irregular patterns and structures on a computer, and the beauty of fractals only adds to the increasingly expanding field of fractal geography as more scientists utilize these beautiful mathematical formulas to computer model the phenomena of nature.